Earlier this week, Naomi Osaka fielded a question from a Japanese reporter who wanted the tennis star to reply in Japanese. “I’m going to say it in English,” Osaka replied. Osaka replied that she was going to say it in English before going into her answer. People in Japan have criticized the media for constantly asking her to reply to questions in Japanese, calling the press “annoying” and saying that athletes are not there to delight reporters. Osaka plays for Japan and was born in the country to a Japanese mother and a Haitian-American father. She is what is known as haafu (ハーフ) or “half” in Japanese. Osaka, however, moved to the U.S. when she was three and has lived there ever since. Japanese people who support Osaka probably want to hear her answer questions in Japanese because she is playing for the country. However, it seems like Osaka’s Japanese utterances have become fetishized by the media. There are expectations for her to answer in Japanese. Flip on Japanese TV, and there are an array of mixed-race Japanese celebrities. The vast majority grew up here in Japan and are native Japanese speakers. The stereotype is that they look cool or have outgoing personalities like foreigners are supposed to have. But what about the ones that don’t? There is a term for haafu who don’t live up to expectations: zannen haafu (残念ハーフ) or “disappointing half.” There is societal pressure placed on biracial kids to meet whatever misguided presumptions exist. Then, there are inevitably awkward situations due to how haafu look, their last names and more. It’s certainly not easy being half as YouTuber humorously points out. My three kids, ages ranging from 15 to 4, are biracial. Their experiences here in Japan have varied, but there are usually expectations. One of the biggest ones has been linguistic. The assumption is that if a person is biracial that they speak both of their parents perfectly as if the language was part of their genetic code. That’s simply not the case! Biracial people who grow up in Japan typically speak fluent Japanese. In a country with historically high literacy and one that puts great emphasis on the native lingo, whether that’s through the systematic number of kanji kids must learn or the continued significance given to teaching Japanese calligraphy, the language has come to represent identity. Japanese, like all languages, is intimately tied to the culture. For a long time, being Japanese has meant having a Japanese name, “looking” Japanese, “acting” Japanese and speaking and reading the language perfectly. Are things changing? Legally, if you have a Japanese passport, then you are Japanese. Full stop. But what about how society at large thinks? “It is hard to say for sure if the extremely narrow conception, unconsciously or consciously, held by many Japanese of being Japanese, is being loosened,” Naoko Hashimoto, who researches national identify at the University of Sussex in England, told the AP (via Asahi). 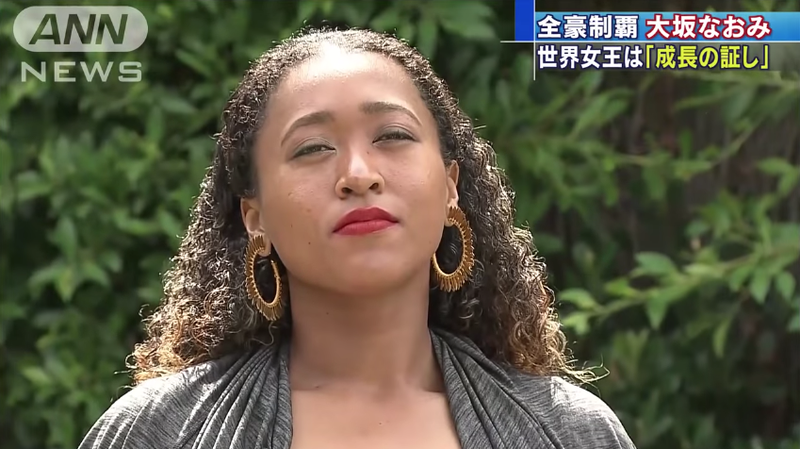 So while biracial people in Japan might not even be expected to speak or know Japanese due to their appearance or the larger societal presumptions, Osaka is now expected to show her Japaneseness, whether that’s being asked about her love of Japanese food or asked to say things in Japanese. Her situation is reversed, but the expectations are still there. These are expectations that are not put upon Japanese coming from a singular background. “When someone asks me a question like that, it really throws me off because then I really have to think about it,” Osaka was quoted by The Associated Press as saying. “I don’t know. I don’t really think that I’m three separate—like mixes of whatever. I just think that I’m me.” And the only expectation that should exist is for someone to be him or herself. Below are some interesting clips about the biracial experience in Japan.